11. “ICT and Cities Revisited.” With Emmanouil Tranos. January 2, 2019. Abstract. This paper tests whether or not adoption of information and communication technologies (ICT) has offset agglomeration benefits and led to more dispersed spatial structures worldwide. The paper returns to Ioannides, Overman, Rossi-Hansberg, and Schmidheiny (2008) and confirms, first by relying on the Pareto (Zipf) coefficient of the city size distribution as a proxy of spatial dispersion, that the diffusion of fixed telephony has caused more dispersed urban structures worldwide, in other words, greater urban decentralization. Similar causal effects are established for mobile telephony,which are novel, and the internet, which extend Ioannides et al. (2008). They are confirmed for such alternative measures of dispersion as the Gini coefficient, the Herfindahl index, and the coefficient of variation. PDF. 10. “Introduction.” Yannis M. Ioannides, ed., Recent Developments in the Economics of Housing. Volumes I and II. Edward Elgar Publishing, forthcoming, 2019. The paper serves as introduction to a collection of papers on the economics of housing in two volumes, which follows up on the two volumes edited by John M. Quigley (1997). The collection highlights old and new themes and is organized according the following parts: Vol. I, Housing Demand, Neighborhood Interactions and Neighborhood Choice, Housing Production and Supply, Housing Markets and Real Estate Valuations, Housing Finance, Homeownership and Housing in Wealth Portfolios; Vol. II, Neighborhood Dynamics, Dynamics of Housing Prices, Topics in Housing Indivisibility and Rent Control, Macroeconomic Aspects of Housing, and Diamond-Mortensen-Pissarides Models of the Housing Market. August 2018. PDF on request. The lecture drew from Professor Ioannides’ past and current research regarding the structure of urban systems throughout the world. In particular, the lecture relied on the theme of social interactions, which integrates Professor Ioannides’ research since he joined Tufts as the Max and Herta Neubauer Chair and Professor of Economics in 1995, and its adaptation in the context of modern information and communication technologies, in order to investigate changing patterns in city size distributions using contemporary international data (as reported in Ioannides et al. 2008 and his ongoing research with E. Tranos ). The lecture also utilized his recent research on the structure of medieval Chinese cities and its consequences for modern Chinese cities (as reported in Ioannides and Zhang 2017), and his ongoing research on the consequences of trade for the sizes of ancient Greek cities and their political economy. The lecture ended with a brief focus on the consequences of the interactions approach to understanding and arresting urban decay, or for that matter, promoting redevelopment, in contemporary Athens. Professor Ioannides’ research has been supported by Tufts University, via the Max and Herta Neubauer Chair, and the MacArthur Foundation, via the Research Network on Social interactions and Economic Disparities, directed by Kenneth J. Arrow and Steven N. Durlauf (1996-2006). Inaugural Lecture, Academy of Athens, June 5, 2018. (In Greek) PDF. Abstract. The paper presents a model of housing and labor markets in the Diamond-Mortensen-Pissarides (DMP) tradition. The model treats decisions about housing and labor supply as joint decisions of individuals, articulates how the renting and owner segments of housing markets adjust through turnover flows and highlights the transitions across different discrete states in those markets, that is owner-to-owner, owner-to-renter, renter-to-owner, and renter-to-renter by unemployed or employed workers. It allows for vacancy rates in the rental and owner segments of the housing market, and introduces a novel concept of “unemployment” in housing markets thus allowing for the definition of Beveridge curves for housing markets. The paper documents the empirical significance of these concepts by means of data from the Panel Study of Income Dynamics for 1969–2015. Abstract. International trade models typically consider countries exchanging goods/services, while urban models often examine the consequences of domestic trade for city structure. Relatively little known research synthesizes these features to allow for shocks propagating domestically with both domestic and international trade. One exception is Autor et al. (2013), who examine how Chinese imports impact US domestic labor markets. imposing spatial equilibrium across cities. The second IV equation examines how international exports from a city, transfers, and domestic shipments impact city-level GDP. We also consider a third set of equations, which explores how economic integration, domestic and international, affects city-level GDP growth. In general, our empirical estimation results confirm the signs/magnitudes predicted by the theory, and imply that labor market shocks in trading cities affect city-level GDP, which in turn impacts housing prices. This theoretical approach, synthesis of city-level data, and empirical analysis are completely novel. 6. “Vacancies in Housing and Labor Markets.” With Jeffrey E. Zabel. June 27, 2017. PDF. Abstract. The Great Recession of 2007–2009 has prompted a focus on the link between the housing and business cycles. We model the housing and labor markets by means of a DMP-type model that treats housing and labor supply as joint decisions and highlights the interdependence of vacancies in these markets. We estimate this at the MSA level using data on housing vacancies from the US Census Bureau’s Housing Vacancy Survey (HVS) starting in 1986 and on job vacancies from the Conference Board’s Help-Wanted Index starting in 1951. In particular, we estimate a Beveridge Curvefor labor markets that includes spillovers from vacancies in the rental and homeownership housing markets, as well as novel Beveridge curves for owner and rental housing markets. We then estimate VAR models for housing and job vacancies. Results from impulse response functions show that shocks to rental and homeownership vacancies have negative and significant impacts on job vacancies. 5. 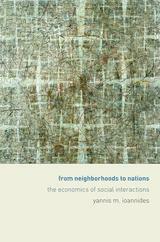 “Endogenous Social Networks and Inequality in an Intergenerational Setting.” Rev. January 1, 2019. PDF. Human Capital and Economic Opportunity Global Working Group paper. Abstract. The paper examines the interactions between human capital investment and social networking as well as their joint evolution, where the latter may be endogenous or exogenous. It revisits the static model of Cabrales, Calvo-Armengol and Zenou (2011), reexamines its stability properties and extends it to dynamic settings with intergenerational transfers of human capital and social networking endowments as joint decisions in dynastic models as well as overlapping-generations models with increasing demographic complexity. Dynamic counterparts of social multipliers are shown to characterize the optimal solutions. Intergenerational transfer elasticities exhibit rich dependence on social effects. The model with exogenous networking highlights the separable effects on human capital dispersion of social connections alone, as distinct from their joint effects with the intertemporal evolution of skills. Multiple Pareto-rankable non-autarkic steady state equilibria may exist, the lower of which is dynamically stable and the higher dynamically unstable. The model’s stochastic steady states allow us to study the cross-sectional human capital distribution due to shocks to certain model parameters that are interpreted as shocks to cognitive and non-cognitive skills. Abstract. This paper tests whether the internet and communication technologies have offset agglomeration benefits and led to more dispersed spatial structures or enhanced urban externalities and resulted in more concentrated spatial systems. Both empirical and theoretical studies have researched this question, but (i) revealed opposing findings, (ii) were based on assumptions about technological capabilities which do not necessarily hold today, and/or (ii) used data from times before digital technologies reached the current maturity level. We address these issues by estimating a multi-country model which tests the effect of digital technologies on Zipf coefficients using recent data. Then, we focus on the US and the UK, for which we obtained novel data, to test whether such effects exist for smaller cities which were not included in our global data. The results, which appear to be robust against endogeneity, illustrate a complementary relationship between the internet, mobile and fixed telephony and agglomeration externalities. 3. “Why Productivity Enhancing Reforms Will Help Greece Exit the Crisis and Usher in Long Run Growth.” January 24, 2015. PDF. Abstract. The paper first assesses various ideas about getting growth started, and what might be hampering that. It also details what we could expect in the way of productivity growth when reforms currently envisioned and hopefully in progress are brought to fruition. The discussion draws extensively from the case of the Finnish Great Depression, an episode that all things considered is quite similar to the Greek crisis, which could well justify the term Greek Great Depression. It was precipitated by the shock of the collapse of the Soviet Union, Finland’s greatest trading partner at the time, but was also accompanied by a banking and credit crisis. It was followed by an admirable period of economic growth, which I find a rich source of lessons for the Greek crisis. The paper details growth-hampering features of the Greek educational system and discusses in depth growth-enhancing properties of market deregulation. Small improvements in each of many markets and industries can add up to significant contributions to Greece’s total factor productivity growth performance. Second, in the immediate aftermath of fiscal stabilization, the problem of the Greek trade deficit, which some consider as the principal cause of the crisis remains acute. The considerable improvement in unit labor costs that has taken place has not been followed by a commensurate improvement in the trade deficit. Recapturing and realizing gains in foreign markets is in part a problem that Greece shares with other “peripheral” EU countries, and to a degree not sufficiently appreciated and widely discussed. Real appreciation of the euro appears to be mainly due nominal exchange rate appreciation rather than domestic costs (measured via either unit labor costs or the consumer price index). This in turn suggests that in order for Greece to improve its advantage in international markets it needs to accelerate its effort at productivity improvements and just as much at growth-enhancing product market reforms. 2. “Searching for the Best Neighborhood: Mobility and Social Interactions,” with Giulio Zanella, April 2008. PDF Under revision. Abstract. The paper seeks to contribute to the social interactions literature by exploiting data on individuals’ self-selection into neighborhoods. We study a model in which households search for the best location in the presence of neighborhood effects in the formation of children’s human capital and in the process of cultural transmission. We use micro data from the PSID which we have merged, using geocodes, with contextual information at the levels of census tracts and of counties from the 2000 US Census. We control for numerous individual characteristics and neighborhood attributes and find, consistently with neighborhood effects models, that households with children, but not those without, are more likely to move out of neighborhoods whose attributes are not favorable to the production of human capital and the transmission of parents’ cultural traits, and to move into neighborhoods which instead exhibit desirable such attributes. Abstract. This review of current research on networks emphasizes three strands of the literature on social networks. The first strand is composed of models of endogenous network formation from both the economics and the computer science literature. The review highlights the sensitive dependence of the topology of endogenous networks on parameters of the behavioral models employed. The second strand draws from the recent econophysics literature in order to review the recent revival of interest in the random graph theory. This mathematical tool allows one to study social networks that result from uncoordinated random action of individuals in setting up connections with others. The review explores a number of examples to assess the potential of recent research on random graphs with arbitrary degree distributions in accommodating more general behavioral motivations for social network formation. The third strand focuses on a specific model of social networks, Markov random graphs, that is quite central in the mathematical sociology and spatial statistics literatures but little known outside those literatures. These are random graphs where the events that different edges are present are dependent, if edges are incident to the same node, and independent, otherwise. The paper assesses the potential for economic applications with this particular tool. The paper concludes with an assessment of observable consequences of optimizing behavior in networks for the purpose of estimation.